Horsepower gains, depending on boost levels, engine volumetric efficiency and other factors, range from 30% to more than 75%. 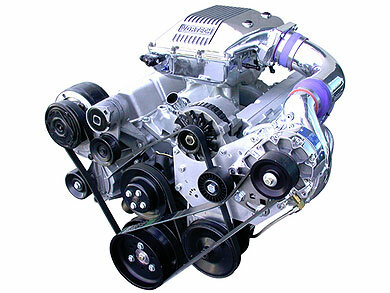 Vortech gear driven supercharger for unmatched reliability. Technologically advanced, high-efficiency impeller and housing design developed in Vortech's supercharger test cell to meet SAE J1723 Standard. Cast aluminum carburetor enclosure assembly for use with Holley #4150 or Demon 750 MD carburetor. The enclosure pressurizes the float bowls and throttle shafts for seamless response. It features front and rear -8 AN fuel inlet ports as well as multiple locations for pressure/vacuum connections. Linkage arms, splined shaft, and left/right hand spherical rod ends are included for simple throttle connection and adjustment. Carburetor studs are also supplied. 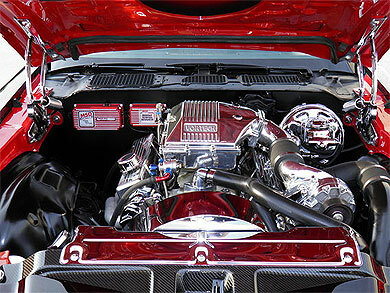 For more on the carburetor enclosure click here. Cast aluminum mounting bracketry with all necessary hardware. 3/8" thick nickel plated steel for rigid supercharger attachment. Inlet and discharge duct connection utilize-heat resistant silicon sleeves and premium quality stainless steel clamps. 10-rib, 6061-T6 billet aluminum supercharger crank pulley with hard anodize finish (6" diameter) and pulley spacer. Installation of this system requires a high volume fuel pump and properly jetted 4150 style carburetor must include mechanical secondaries, correct needle and seat and possibly a nitrophyll float set, depending on boost level. 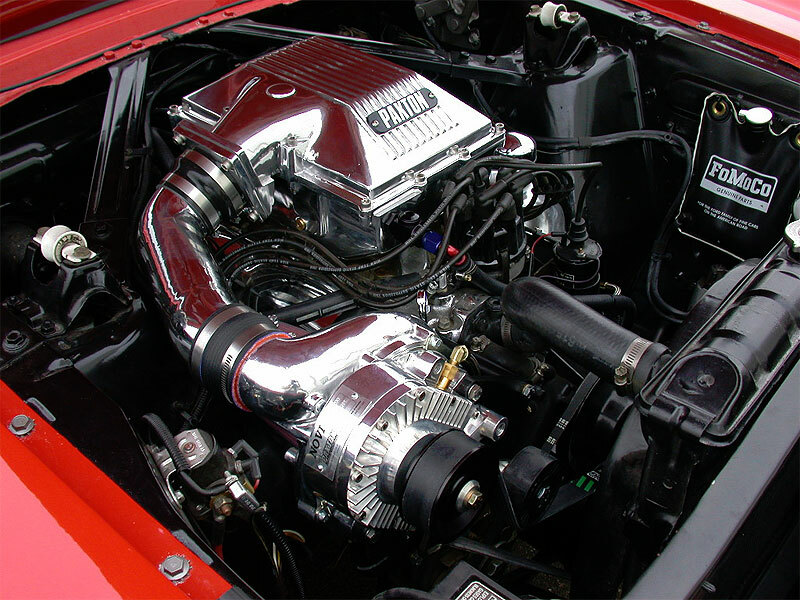 For '67-'69 Camaro/Firebird applications, in addition to the cowl hood, minor under hood trimming may be necessary and we recommend using an Edelbrock Victor Jr. manifold. For best results, we suggest a compression ratio range of 8:1 to 9.5:1 with 9:1 being ideal. A mild "street" camshaft is best since a centrifugal supercharger by nature doesn't require a lot of overlap for maximum efficiency. On early engines, a high-performance, boost referenced mechanical fuel pump will provide the necessary fuel in most applications. Late model motors may require an electrical fuel pump and a boost referenced fuel pressure regulator providing 6 lbs. of pressure. This system was designed to fit on engines equipped with a "long" water pump and OEM V-belt drives or serpentine accessory drives. For correct belt alignment, the proper accessory drive crank pulley and accessory bracketry must be used. These components are not supplied in this system. Earlier models equipped with short water pumps will require a long water pump to be installed. For engines equipped with power steering and V-belt accessory drives, a Saginaw style pump will be required as well as an optional Vortech power steering assembly (4GP110-051). Polished finish systems include the discharge tube shown on the engine above and a 3-ply fiberglass reinforced silicone discharge hose (not pictured) for universal installation. *Estimated boost levels based on 350 cubic inch engine at 5500 rpm max.